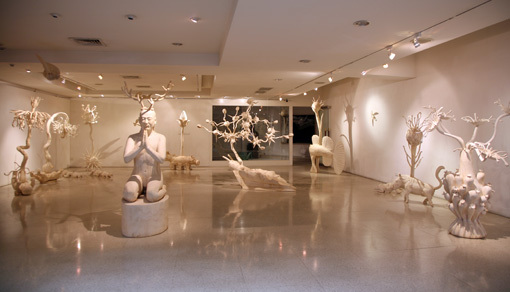 Cang Xin started to do began to involve himself in performance art in the 1990s. He took part in that decade's most important work of Chinese performance art, To Add One Meter to an Unknown Mountain (1995 , performed at Miao Feng Shan in Beijing ). The concept behind this piece was ─ making the human body become part of the environment ─ created a milestone in the Chinese performance art . People first took note of Cang Xin 's first impressive statement was made with his series Communication , in which he licks objects such as books, cups, stamps, exhibition catalogue art album s , cell phones, paper money, and even the Great Wall, the Forbidden City, and the ground in Oslo, Norway. In Communication, he was demonstrating the Oriental concept that all things have a soul by forming esoteric contact and communication with different objects through the ritual action of licking them. 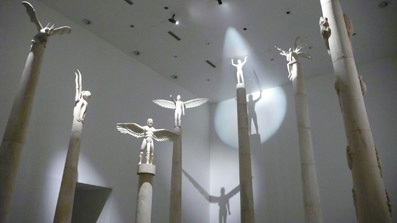 Following Communication , in his Identity Exchange series, Cang Xin exchanged clothes with people of different identities and social status, including a chef, a university professor, a policeman, a mental patient, and a Peking opera Opera actor, to extend his belief about soul to a societal context . demonstrate the social context of the soul. 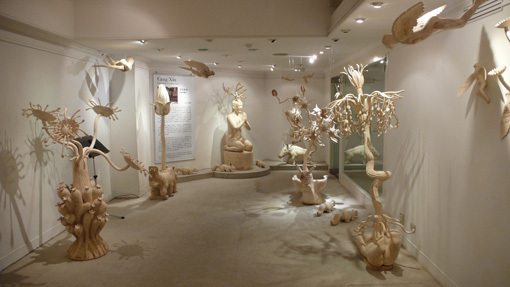 From 2004 onwards, Cang Xin began a creation that to focus es on the shanmistic-based mystical religions of different nomadic peoples and hunters from northern China , including, for example, the ancient Huns, the Xianbei, the Nuzhen, the Huihe, the Manchus, and Mongolian tribes. For him, their religions, such as Nestorianism, Xianjiao, and Islamic Sufism, reveal the primeval, uncorrupted mental state of early humanity. He has also taken the ancient Chinese collection of mythology and geographical accounts Classic of the Mountains and Seas as inspiration to deduct his view to the primal state of life. create primal landscapes featuring himself. The Exotic Flowers and Rare Herbs series is inspired by the Five Phases of Chinese philosophy, the five elements (metal, wood, water, fire, and earth) that are said to make up the universe according to Chinese mythology . A nd art pieces in the series are made up with . w W ood , which is the medium used in this series because of its importance important and significant in the development of Oriental civilization and because it is of nature . 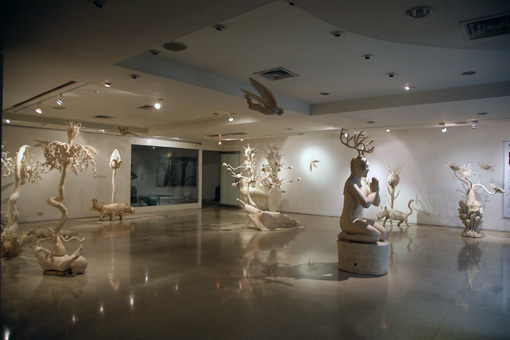 The series is based on a part of Cang Xin's previous work Cang Xin Xin's Mythology entitled Shamanism . 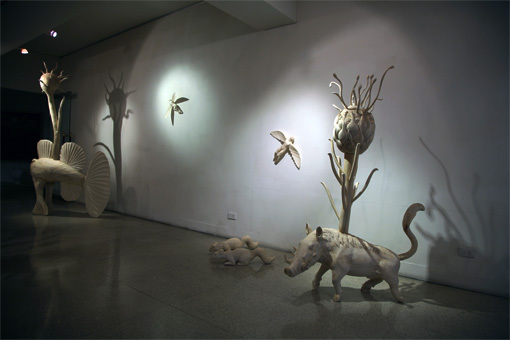 Displayed alone, the piece s express es the “ unbounded thought ” that says the re is not a boundary l ying ies between “ organic life ” and “non- organic life . ” objects, which They are imbued with significance, able to transform each other, and representative of veneration for spiritual consciousness. 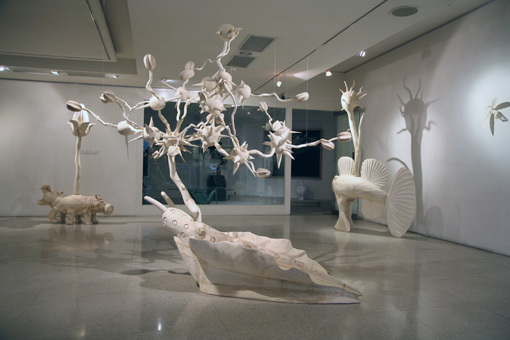 For Cang Xin, the artist is like a shaman, a medium for transmitting higher knowledge and energy, creators who are also being created. Cang Xin bestows the pieces in his Exotic Flowers and Rare Herbs series with life and significance. The deformed human figures that look like the artist, for example, symbolize his true reality. Infants are forms representing implied meaning, and his animals and plants represent reincarnation. These three elements form Cang Xin Xin's mystical world.